Summary: Elephants are gray and pigs are pink. 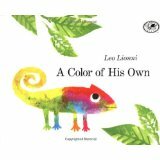 Each animal described in the book has a color of his or her very own except one – the chameleon. Chameleons change color based on their environment. The chameleon in this story changed his color everywhere he went. He contemplated staying in one location so that he could have his very own color too. When that didn’t work out, he eventually met another chameleon and shared his story. He shared how he was sad and really wanted to have his very own color. They decided that they would stay together so that they wouldn’t be alone and could be different together. Literary elements at work in the story: Leo Lionni’s story is full of painterly illustrations that beautifully compliment the meaningful and simple writing style. The illustrations are very bright, colorful, and appear to be created using watercolor but they are quite textured. The colors used in the book also are utilized to portray mood within the story. How does the perspective on gender/race/culture/economics/ability make a difference to the story? The main chameleon character is a male as is the friend that comes into the story towards the end. The other animals are specified as a particular gender. The male gender challenges stereotypes that males don’t desire companionship as women stereotypically do. Theological conversation partners: We are called to be active participants in community with God and others. Being church is more rewarding, more challenging, and fuller when we travel life together as we learn to embrace ourselves as created in the image of God and fearfully and wonderfully made. What are ways that we are each different from one another? What are things that we all have in common? Read Genesis 1:27. What does it mean to be created in the image of God? Sometimes things are hard but we don’t have to endure the hard times alone. Who are people that help you when you are sad and lonely? A Color of His Own by Storypath is licensed under a Creative Commons Attribution-NonCommercial 4.0 International License.